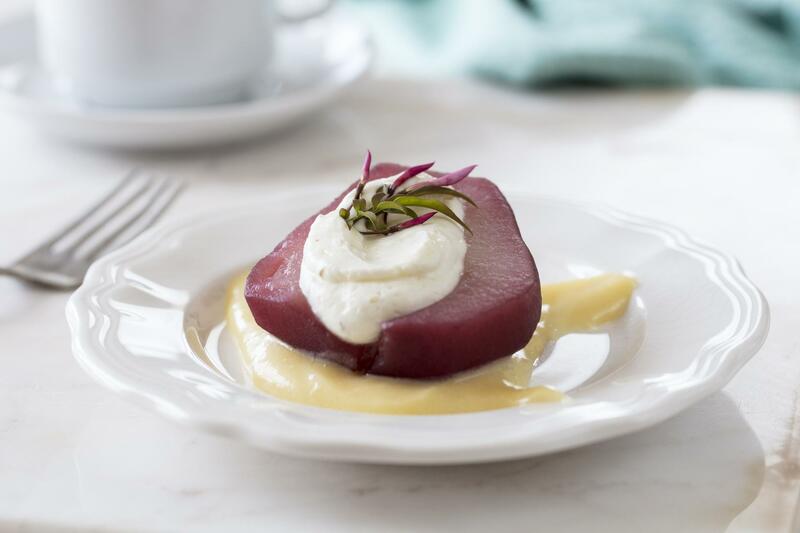 Pears poached in spiced red wine and filled with a generous cloud of Purple Haze® cream—the dessert that dreams are made of. Peel pears and place in a large saucepan. Add wine, sugar, and water. Bring to low boil, then add vanilla, cinnamon sticks, bay leaves, and star anise. Simmer for about 20 minutes, or until pears are fork-tender. Cool pears in wine mixture to room temperature. Refrigerate in the poaching liquid until you’re ready to serve. To make the filling, whisk together Purple Haze and heavy cream until smooth. Transfer to a pastry bag, or use quart size sandwich bag with a snipped corner. Slice pears in half lengthwise. Remove seeds and fibrous center with spoon. Use pastry bag to fill each pear half with Purple Haze cream. Serve on a bed of lemon curd.